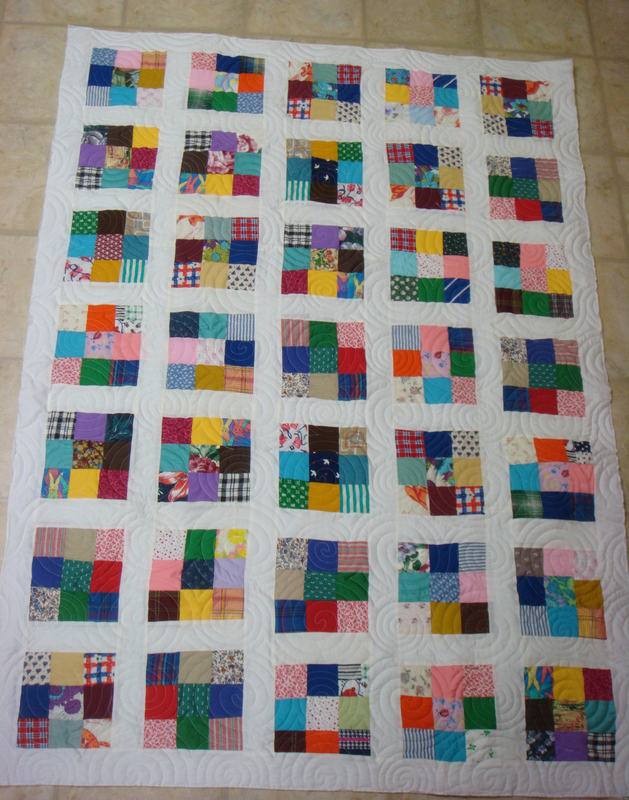 This scrappy nine-patch quilt is the ninth top that I have quilted for my mother. It is one of the eleven quilts she is making as wedding gifts for her grandchildren. She told me last week that she was very pleased that I had suggested she make them now, even though no one is engaged to be married. She said she would not have had the idea to do it. Now each of the grandchildren will have a wedding gift from their grandmother, even if she is no longer living when they get married. Mom is 94 and the youngest grandchild is only 13. Despite her fabulous health, it is quite possible she may not live long enough to see him married! Marrying a bit later than normal seems to be a trend in our family. It seems that we all want to be well-educated and travel the world before we settle down! Be cause the eighth and ninth quilts were so much alike, I mounted them both on the long arm at the same time with one wide backing. This quilt is also quilted with the Circle Lord Swirls design with a white thread. It works up quickly and the movement of the design seems to take the eye away from any piecing challenges. Goal Status: 36 quilts done and 16 more to go to reach my goal of 52 completed quilts by Dec 31st. There are 5 and a half weeks left to New Year’s Eve, so that means I have to finish three projects per week. Still manageable, I think! I’m going to have to be very efficient in my Christmas preparations. I will have to ensure my family’s offers to help are warmly accepted! This entry was posted in Completed Quilt Project and tagged Lap Quilt, Nine Patch Quilt, Scrap Quilt, Simple project, Wedding Quilt. Bookmark the permalink.